(CNN) -- Center right and minority parties make gains across Europe as turnout in elections for the new European Parlimanent dips to a record low of 43 percent. Below is a country by country selection of some of the key results at national level. 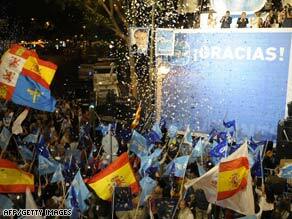 Supporters of the Spanish opposition party Partido Popular celebrate in Madrid Sunday night. The center-right GERB opposition party collected 26.2 percent of the vote and five seats, beating the ruling Socialists (18.9 percent/4 seats). The ultra-nationalist Ataka party and the liberal Turkish minority MRF party will send two MEPs each to Brussels after both winning around 11 percent of the vote. French President Nicolas Sarkozy's center-right UMP (28 percent/30 seats) dealt a heavy defeat to the main opposition Socialist Party (16.8 percent/14 seats) -- but the Socialists also lost voters to veteran leftist Daniel Cohn-Bendit's Europe Ecologie green party, which placed third with 16.2 percent of the vote (14 seats). Chancellor Angela Merkel's conservative Christian Democrats (30.7 percent/34 seats) were the clear winners in an election seen as important indicator of voter intentions in general elections later this year. The Social Democrats, Merkel's Grand Coalition allies but main electoral rivals, won 20.8 percent and 23 seats while the Greens placed third (12.1 percent/14 seats). The socialist opposition PASOK capitalized on dissatisfaction with Prime Minister Costas Karamanlis' center right New Democracy party, winning 36.7 percent and 9 seats. The extreme nationalist anti-Gypsy Jobbik party made an electoral breakthrough, winning nearly 15 percent of the vote to send three MEPs to Brussels for the first time. The center-right Fine Gael scored an historic win, beating the ruling Fianna Fail party for the first time since the 1920s and claiming four seats with nearly 30 percent of the vote. Fine Gael leaders said they would call a motion of no confidence in Taoiseach Brian Cowen's government this week. Prime Minister Silvio Berlusconi defied political troubles and personal scandals with his right wing People of Freedom block winning nearly 35 percent of the vote and 29 seats, while the anti-immigration Northern League saw its share of the vote climb to 9.5 percent, gaining it 8 seats. The former leader of Soviet Latvia, Alfreds Rubiks, who spent three years in jail following the Baltic state's break from Moscow in 1991 and is banned from participating in domestic politics, was elected as an MEP as the leftist Harmony Center party, which draws support from the country's large Russian minority, gained 19.5 percent and two parliamentary seats. The anti-immigration Freedom Party, led by controversial lawmaker Geert Wilders, placed second with 17 percent of the vote and four seats. The ruling Christian Democrats finished just under 20 percent with five seats. Ahead of general elections later this year, the center right Social Democrats claimed the biggest share of the vote with 31.2 percent of the vote and eight seats as the ruling Socialists (26.6 percent/7 seats) saw their support base eroded by a swing to leftist and green parties. The opposition conservative People's Party (42.2 percent/23 seats) scored its first national electoral success over the ruling Socialists (38.5 percent/21 seats) in almost a decade as voters registered their dissatisfaction with the state of the economy and high levels of unemployment. Sweden's Pirate Party, which calls for the legalization of internet file sharing, claimed seven percent of the vote and one seat in the European Parliament following the conviction in April of four men behind the Pirate Bay free file-sharing Web site. The far-right British National Party will send two MEPs to Brussels for the first time with a 6.2 percent share of the vote while the anti-EU UK Independence Party gained 16.5 percent and 13 seats to finish second to the opposition Conservatives (27.7 percent/25 seats). The ruling Labour Party toppled to their worst election performance in a century on the back of dissatisfaction with Prime Minister Gordon Brown's government.